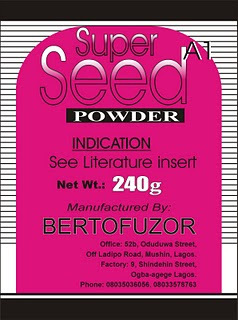 DR ALBERT OJIEH: SUPER SEED A1 POWDER. Disease and people, DIABETES: are you a victim, your brother, sister or friend for how long? 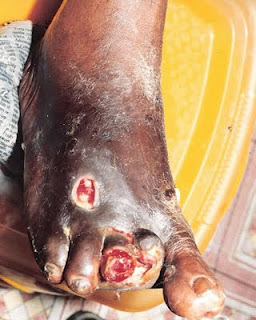 is it type One (1) or type Two (2), Are you having gangrene in any part of your body? Cool down all your diabetes complications will be taken care of by SUPER SEED A1 POWDER. SUPPER SEED A1 is for the treatment of Diabetes Mellitus and Diabetes Insipidus. This remedy has an anti-inflamatory preparation. It helps to reduce tumors and also reduce nervous system disease. It regulates the pancreatic hormones such as insulin and glycogen. The bitter taste stimulates appetite it also helps greatly for indigestion. Because of it strong hypoglycemic properties, it is absolutely necessary that the fasting blood sugar test be conducted before and during the management period. If your sugar live has dropped to normal, your present glucose level will determine how often you will do your test to avoid hypoglycemia. Next action is maintaining it by obeying what nature needs. Discipline, fasting and exercise are equally good during the treatment and management, so as to keep you fit all the time. Your diet is another major factor for re-occuring and rise in your sugar level, therefore, diet chart must be followed. Avoid alcohol, simple sugar drink and foods alike, your Doctor will advice on your diet. If the condition persist report to the doctor. Office: 52B, Oduduwa Street, Off Ladipo Road, Mushin, Lagos, Nigeria. Factory: 9, Shindehin Street Ogba-Agege, Lagos, Nigeria.